Mobile Operators globally are looking at ways to increase service revenues without the need to sacrifice service quality. With SMS revenues being the 2nd largest contributor for many Mobile Operators after voice and with forecast of its continual increase in contribution, SMS is naturally one of the major areas to look at in any effort to increase revenues. Routing International SMS traffic via IP enables Mobile Operators to have more routes and remove the need to increase costly SS7 link resources. This creates an opportunity for Mobile Operator to increase their International SMS revenues. All that is required is a solution that allows Mobile Operators to do just that. That is where Mocean International SMS Routing solution provides the answers. 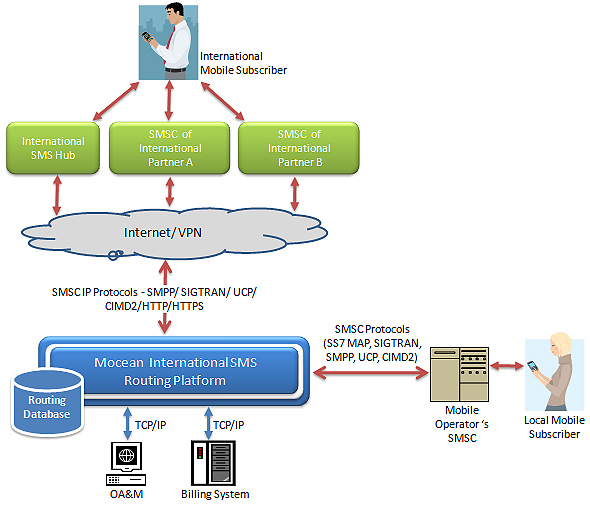 Mocean International SMS Routing (ISR) solution provides the ability to Mobile Operator to connect to International traffic partners (other Mobile Operators or SMS Hub) via IP, either using the Internet or Virtual Private Network. This will enable Mobile Operator to send and receive SMS traffic using SMSC IP protocols such as SMPP, UCP, CIMD2, HTTP, HTTPS or SIGTRAN. Mocean ISR enables Mobile Operators to minimise the requirements to setup additional SS7 links for International SMS traffic routing. As a result, Mobile Operator’s cost will be reduced significantly and this can be passed on to Mobile Subscribers, encouraging more traffic. Mocean ISR provides Mobile Operators the ability to connect to more International partners that maybe using difference mobile technology (CDMA and GSM), increasing traffic exchange and providing business flexibility. Routing capabilities on Mocean ISR allows Mobile Operators to create routing of SMS traffic based on the least cost, ensuring higher margins on SMS revenues. With the flexibility to link up to more networks using Mocean ISR, this increases Mobile Operator’s available destinations for their Mobile Subscribers. With routing International SMS traffic via Mocean ISR, Mobile Operators will be able to control and monitor via a central platform, simplifying operations and support. Available system redundancy options ensure high availability of the system, providing Mobile Operator’s a peace of mind to concentrate on building the SMS business. Therefore, Mobile Operator will be in a Catch-22 situation where expenses will rise in order to add capacity but if that is not done, additional services cannot be launched easily. Looking at the huge revenue potential still available from SMS services (ABI Research indicated that the industry could be looking at USD$ 177 billion in global service revenue in 2013), Mobile Operators will need to find a balance between expenditure and enhancing service revenues. This is where Mocean SMS Router comes in and provides the ideal solution for the situation faced.